Are you planning a short visit to Paris for 4 days? We suggest many day trip ideas in Paris for you to choose from. Paris, the river Seine, Bateaux-Mouches, the canals… Why not devote one of the four days during your stay in Paris on water? A pleasant way to visit the capital. The banks of the Seine are not to be missed during a 4-day visit to Paris. Start your visit of the capital on Île de la Cité where the history of Paris begins. Notre-Dame can be visited free of charge. If you are passionate about Gothic architecture, you can discover the Basilica of Saint-Denis, the royal necropolis and jewel of radiant gothic art. Rendez-vous at République to discover Canal Saint-Martin. On foot, bicycle or boat, go along the canal and its banks and immerse yourself into the relaxing atmosphere of the canal, its shops and cafés. Many restaurants are open for lunch. 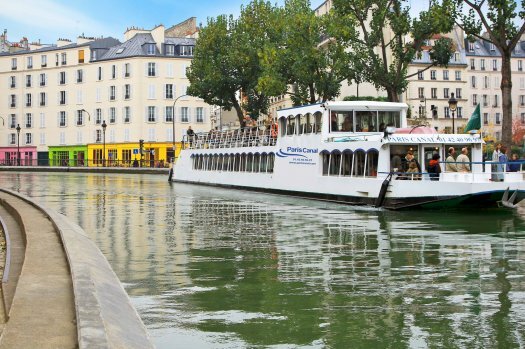 Make your way towards Bassin de La Villette and the Canal de l’Ourcq up to Parc de la Villette. Many cruises are proposed from Bassin de La Villette: so why not take a barge to discover all the treasures of Canal de l’Ourcq: street-art, industrial heritage, surprising shops such as the library barge, etc... You can also pursue your journey to the Cité des sciences or simply ramble around in the park. From your hotel at Gare de l’Est or Gare du Nord, you can walk to the unmissable sites in Montmartre to discover the Sacré-c½ur, Place du tertre and its painters. Take the opportunity to discover the Halle St-Pierre and its quirky exhibitions. You can also continue on to Pigalle and the Moulin Rouge. Do not miss “Little India” neighbourhood, rue Cail and area around Gare du Nord. We suggest you visit the Paris Saint-Ouen Flea markets (open from Friday to Sunday). You can have lunch in a restaurant at the Flea market and then go bargain-hunting in the various markets and stands. On other days, you can opt for a visit to Barbès and Goutte d’or neighbourhoods to discover cosmopolitan Paris and do some shopping. Guided visits of the popular districts in Paris are proposed. There are many theatres around République to see a play or show. After doing some window shopping on the mythical Place Vendôme and its luxury boutiques not forgetting the rue Saint-Honoré, go and do some real budget-friendly shopping. Find great deals among the vintage stands at the Paris Saint-Ouen flea market. In the thrift or luxury stands you will probably come across an expensive bag or piece of jewellery or simply the perfect outfit to complete your wardrobe. On the opposite side, in the Clignancourt flea market, you can find Malik market with its street wear, fashion and luxury clothes. If you are planning a shopping spree in a shopping complex, go to Chatelet where you will find many shops and fashion boutiques on the pedestrian streets, but also in the underground mall (Forum) and la Canopée (outdoors) which opened in 2016. Discover some other Paris shopping centers. Discover Beaubourg and the Centre Pompidou, and take the opportunity to discover Le Marais and its various art galleries. You will find several contemporary art centers in Paris : Palais de Tokyo, Plateau in the19th district, etc. Some of the Paris streets are, in themselves, a vast open-air gallery: stencils, graffiti, mural frescoes, etc. Street-art is at every corner. You can go back to République and the quarter of Ménilmontant or continue to Canal de l'Ourcq, largely taken over by street artists. Where to sleep during your short stay in Paris? Paris is not a very big city, so you can stay in the same hotel during your entire visit. Go back and forth to your hotel each day thus avoiding the stress of moving around with your luggage. If you are staying just a few days in Paris, it is best to choose a hotel in the heart of Paris. Book a hotel room around Gare de l’Est which is a good solution as it gives you rapid access to many sites of interest. Paris Tourist Office proposes: Pass to discover Paris.